Holiday shoppers have flocked to the Apple website in record numbers, allowing the company to score more visitors than Walmart, Best Buy, Sears, eBay and other popular holiday shopping locations. 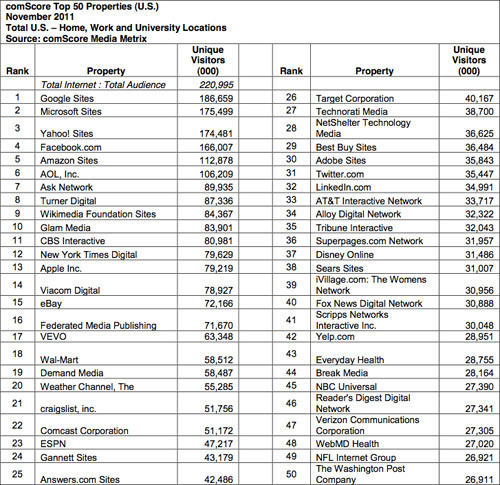 According to a recent comScore report Apple’s website scored 79.2 million unique visitors in November, passing second place finisher eBay(72.1 million uniques) and third place finisher Walmart (58.5 million). In fourth place was Best Buy, a company that was forced to cancel thousands of orders after 36.5 million customers took to their website. Apple ranked 13th overall for the webs most traffic intensive websites that includes the likes of Google, Faebook, Yahoo and others. According to the index much of Apple’s traffic likely came from their yearly Black Friday sales ad that offered rare Apple product discounts on a wide variety of Apple products. Are you surprised to learn that Apple traffic has been so high given the success of their iPhone and iPad offerings.